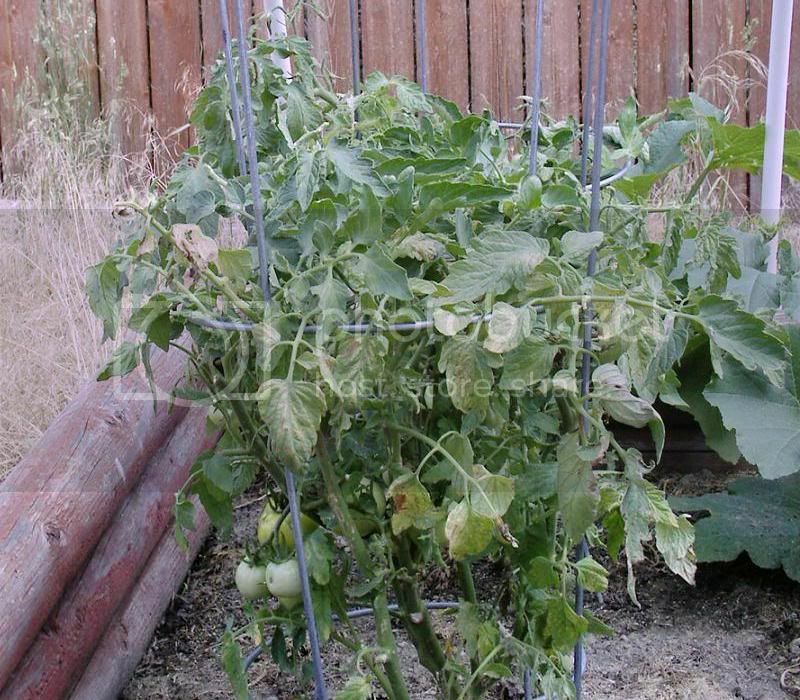 The black spot on one of the tomatoes is a hail ding. Both broke their stems in the bad hail storm we had a month or so ago. Then they were suffocated for a while by some pumpkin leaves. I suppose both these problems contributed to a weakened physical condition and increased susceptibility to disease. Does look like some disease condition... hopefully TZ will come along and identify for you which one. In the meantime, I just wanted to say, I never thought it would happen to you, stella. Are you still doing the AACT foliar sprays? I would have thought that would protect it from this kind of stuff. Still would be good to do as a treatment, since the plants don't look very far gone at this point. Nah. That was TopDollarBread. He (or she) wanted me to do foliar sprays, but I kept resisting. I've got this phobia about wet leaves. 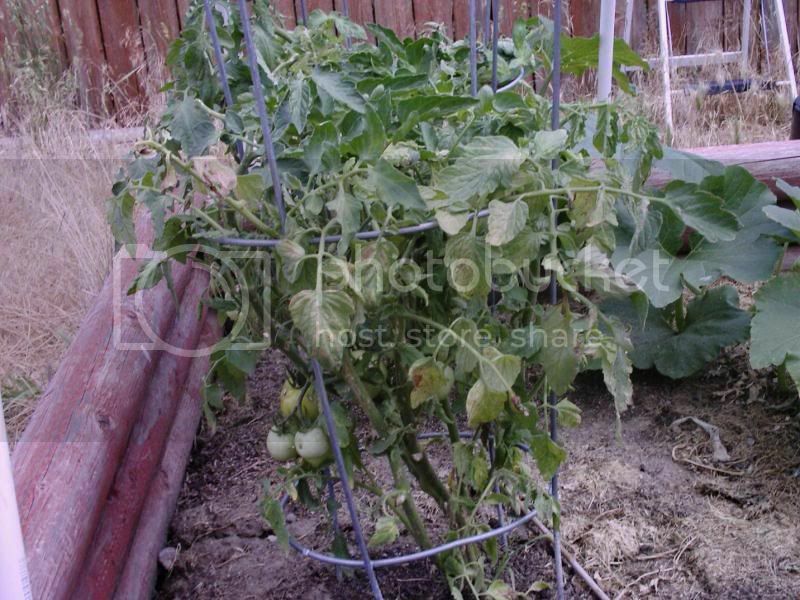 I think one of the reasons my tomatoes are generally disease-free is because we get so little rain up here. We can go for two or three weeks with nary a drop. You do have me thinking, though. Doing something would be better than doing nothing at all and just watching them continue to die. More and more, I am wondering about subsoil parasites. Only one leaf had what might be deemed lesions; the others just gradually turned brown. I will experiment, I think, with different foliar sprays for a while. If they continue to die, I will yank the worst one and take a look at its roots. I also wonder whether I over-watered. I don't think so, but it's a possibility. if you know the plant isnt going to produce anything. i would pull it up and carefully inspect the roots. Another thing to think about is a foliar spray of ACCT is not the same as just water. You are adding the good guys that fight the bad guys just water invites. A foliar spray is definitely worth a shot. I started a batch of tea yesterday for the watermelons and Habaneros, and I'll see what happens with a foliar feeding. At this time of the year, I've generally got a batch going every two or three days. I saw some teeny, tiny new growth on the least ill one yesterday, just some bright green little leaves emerging. They last had tea about a week ago; I used corn meal in the recipe, so maybe it's doing something anti-fungal. I've got corn meal in this new batch, too.